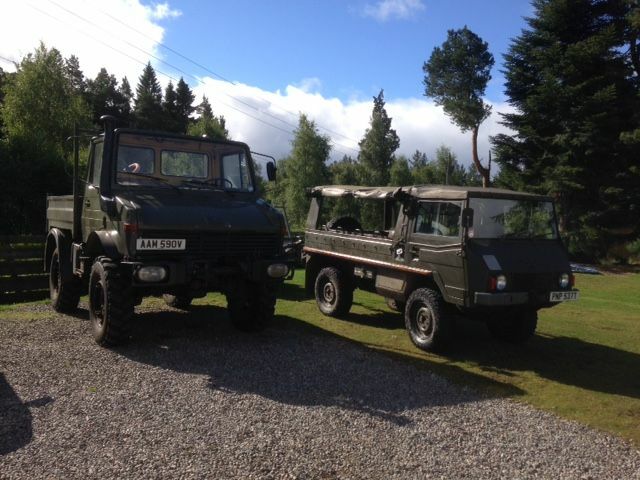 Home » Forums » Other Mercedes & Graz built Off-Road Vehicles » Haflinger, Pinzgauer and Unimog. 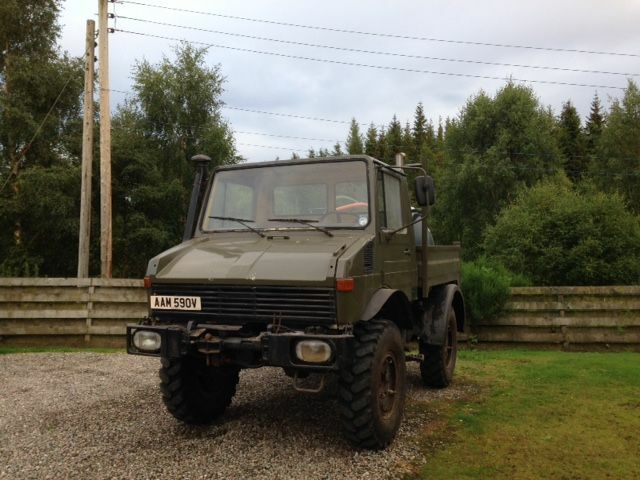 You know those things that you want but don't need, well I am pretty sure that my new Unimog falls into that category. I bumped into the factor of the neighbouring estate whilst driving through the forest in the Pinz. He was quite impressed with the Pinz and said if I liked that sort of thing I should take a look at his 'fire engine'. I took a drive over the hill and was quite surprised to discover that his fire engine was actually a Unimog with a big tank and a pump on the back. He said that it had not been used in anger for about five years and he was thinking about selling it. A few whiskys later and I found myself the slightly bewildered owner of a Unimog. It fired up first time and I drove it over the hill through the forest back to my house. Everything appeared to be working fine until I approached the steading to park it and for some reason the brakes no longer worked and I 'parked it' in the wall. Damage to Unimog zero, damage to steading football sized hole in the wall. The Mog is currently parked in front of the hole to hide it from my wife ! It evidently needs a bit of TLC but I think it will be a lot of fun, my son has already asked if I can take him to school in it . 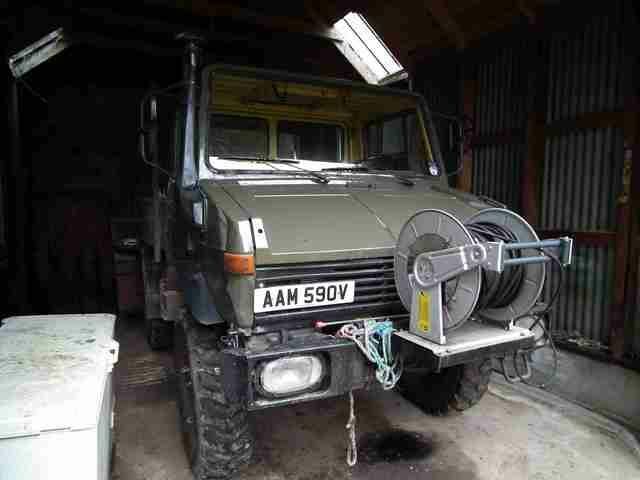 Re: I seem to have aquired a Unimog ! I have nothing by admiration for you! I suspect that a bunch of flowers and a cringy evening at the opera-type of thing will also not suffice to keep your better half from putting you into the proverbial dog house. Well done anyway: time will (have to) heal all! 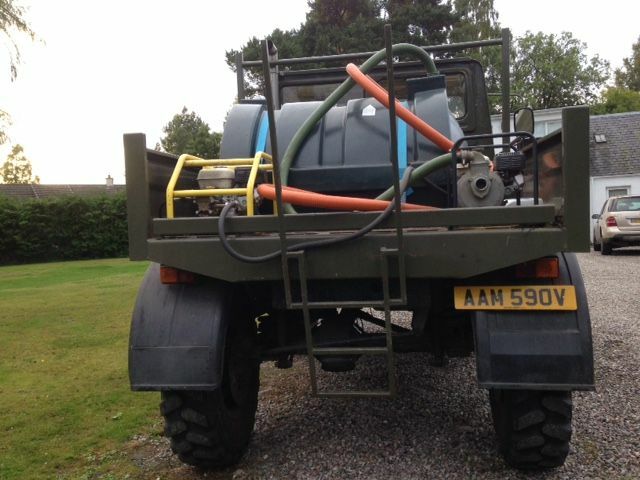 The Unimog has been on my DEFINITELY don't need, but DEFINITELY want list for a number of years......one fine day! I would be very interested to hear your views on how it compares to the Pinz off road. I imagine that in the bog it will be better simply because of the tractor-like wheels/tyres and ground clearance, but down/up twisty scree tracks with plenty of larger rocks I'm not so sure. 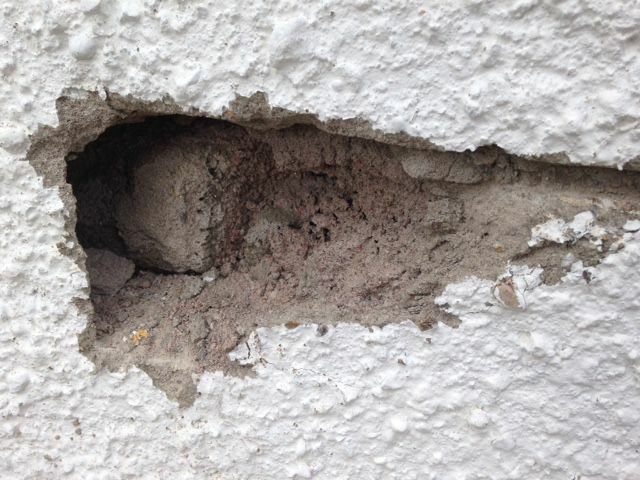 When you get the brakes (and wall) fixed, please let us know what you think. Extra handy - our local brewery sells at a BIG discount if you buy and collect draught in bulk !! That is big mog. Welcome to the club. The MB club said an orange 411 failed to sell at the auction between Perth and Dundee last month.. maybe one to fit betwix your pair? My mogs.. well 406 with no cab/engine and a donor with running engine... well no claims that they can punch holes in walls.. I guess the donor does move and has no brakes (or electrics) but with mogs you can go so slow that it has to be a very fast wall to catch it :-) I do have a nice winch to mount somewhere but it is hydraulic and an unknown quantity.. I think it is big drum/moderate pull for pulling cables onto electric pylons... oh and a set of floatation tyres but they are on 406 rims and you are another bolt pattern size up with an SBU. Wide tyres are good for spreading the load but you lose the ability to climb as your surface pressure is so low. Best English (Americanese) site is http://www.benzworld.org/forums/unimog/ presuming that your German is not up to the motherland's site. 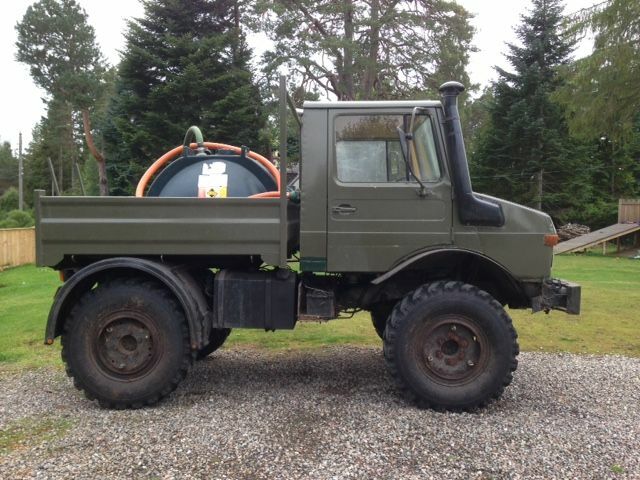 http://www.unimog-community.de DXMedia on Benzworld is another Scot and also has an SBU .. he is a handy spannerman by his accounts .. so maybe of good help but I think he is down Glasgow end of central belt from posts. ​I will definitely do a write up of an off road comparison between the Pinz and the Mog. I will have to find somewhere that the Mog will actually fit, I think my usual trails through the forest in the Pinz would be a trail of destruction in the Mog . Ian, I have the ideal place to test out the fording depth. It is pretty deep so I will pack a couple of oars ! Pictures to follow once I have sorted a few mechanical issues. I am more of a single malt man myself but I do have about a dozen of Speysides finest distilleries within a 20 mile radius so as you suggest I am sure I can find a use for the tank which comes with its own uplift pump. Thanks for all that very useful information, Unimogs are a bit of an unknown quantity to me so I am trying to learn as much as possible. I always liked the earlier round cab versions like your 406 and was not actually looking for an SBU square cab until fate intervened. Mine seems to be in good mechanical order and the chassis looks to be solid. 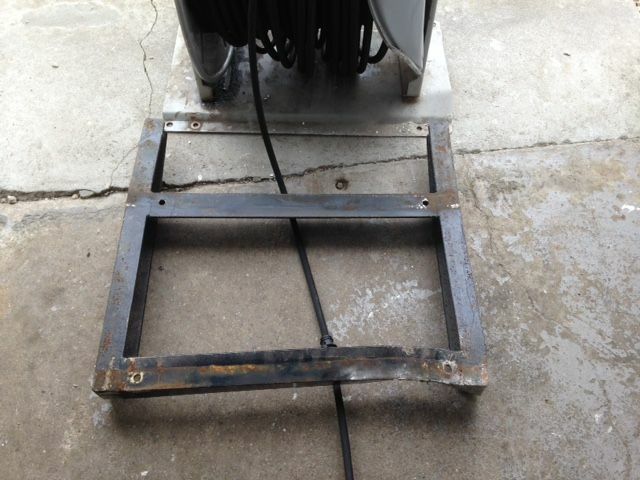 The cab has a few rust issues but nothing that can't be fixed. The worst bit is round the lower windscreen frame which may need a new section welded in at some point. My only immediate concern is with the brakes. When I parked it in the wall the air reservoir was full and reading 8bar but when I pushed the pedal (several times !!) nothing happened. Prior to that they had been working perfectly. They are actually working again now so it would appear to be an intermittent problem on the actual activation side of the braking system and not with the air charging. I am not sure how the braking system works yet so any tips on where to start fault finding would be welcome. Regarding the tyres it actually came with a complete set of Dual Wheels and new clamps as you can see in the photos. The wheels need new tyres but I imagine with the dualies fitted it would make a good swamp monster. As I said it was fitted out as a forest fire engine which appears to have been done to a good standard. It has a new bunded 1000 litre tank with a Honda petrol uplift pump and a Karcher petrol pressure washer outlet pump. These are all attached to the rear bed by custom brackets. It also has a handy detachable ladder to get into the back. 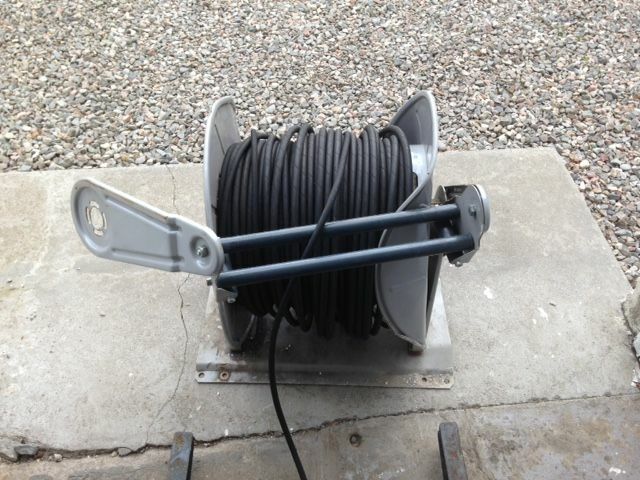 The front had a heavy duty mount with a 100m high pressure hose reel which I am sure I can put to good use elsewhere. Unfortunately the hose reel took the brunt of the impact with the wall and may need a bit of straightening . Although I was going pretty slow the Mog must still have hit the wall with a fair bit of force because it also managed to bend the fairly chunky mounting plate. Wonderful bit of kit...you were doing well till you mentioned Karcher. Moving on swiftly....I look forward to your fording experiments! From the depths of my memories I (probably incorrectly) seem to remember that Rannoch School ran a mini fire brigade and had something similar, are you anywhere near them? The brakes evolved with mogs..
By 1974 all were on discs for 406/SBU. .. then they changed to a remote master cylinder and air servo under the floor of the cab.. with only the air valve under the bonnet.. might have been a 1974 thing too.. not sure. .. and much later they went to pure air with brakes that need pushed off by the air pressure ...like an HGV. Full air will have the air bags at each wheel which are outisde/at back of the wheel not the standard car like flexi rubber hoses + car like calipers on your discs. So make sure you have air... check for air bags at wheels .. then check for fluid .. I decided to put the Unimog to work today for the first time after after removing the fire fighting equipment and giving it an overhaul. Sorry about the quality of the photos it had started to snow !! A lovely little Mog ! This is a little Mog.. that is a fair sized Mog that BigBlock has .. well you might see your feet in the footwell!